Vicenza is situated in the Veneto region of northern Italy on the low hills between the mountains of Berici and Lessini, on a natural communication route. The city of Vicenza was founded in the 2nd or 1st century BC by the Veneti and was granted Roman citizenship with the status of municipium in 49 BC. The ancient town plan is still recognizable in that of the modern town, Corso Palladio being the decumanus maximus and Contra Porti the cardo maximus . Among the public buildings erected from the time of Augustus that survive are the remains of the theatre, now incorporated in a more recent structure, and sections of the aqueduct to the north of the city. The city became the See of a Christian diocese at the end of the 4th century AD. In the 5th century it was on the route of successive barbarian groups, whose ravages were exacerbated by a series of disastrous plagues, which left the region depopulated. It formed part of the Langobardic kingdom and became chief town of one of the 36 duchies. Eventually the pope called on Charlemagne to drive out the Lombards, and Vicenza became a Frankish Countship within the March of Friuli. It was during this period that the first Benedictine communities of San Felice and San Pietro were established. The disintegration of the Carolingian Empire saw fresh invaders, this time the Magyars, whose depredations led to the construction of city walls. The bloody wars between episcopal feudatories and the Ghibelline Counts that disfigured most of the 12th and early 13th centuries raged around Vicenza. The region became divided into a patchwork of small seigneuries, which fought among themselves, only uniting to defy the Holy Roman Emperor. Like most Italian cities of the period, Vicenza evolved its own administration, which in 1208 introduced controls on building within the enceinte of the walls. A new urban perimeter was created by the Della Scala family, enclosing the most important streets within the city. A movement by the small states in the region towards coalescence was interpreted by Venice as a threat and so in 1404 La Serenissima annexed the entire region. Vicenza remained part of the Venetian Republic until its fall at the end of the 18th century. The feudal aristocracy was stripped of its powers and replaced by a dominant mercantile class. Feudal lands were expropriated and sold to patrician Venetian families, who created great agricultural estates on which they built sumptuous mansions. The city also prospered under Venetian rule, benefiting from its situation on a major natural communication route. The town became polarized around the four main piazzas that still exist. There had been limited expansion to the east and west in the late 14th century but the city retained its basic form throughout the succeeding centuries. 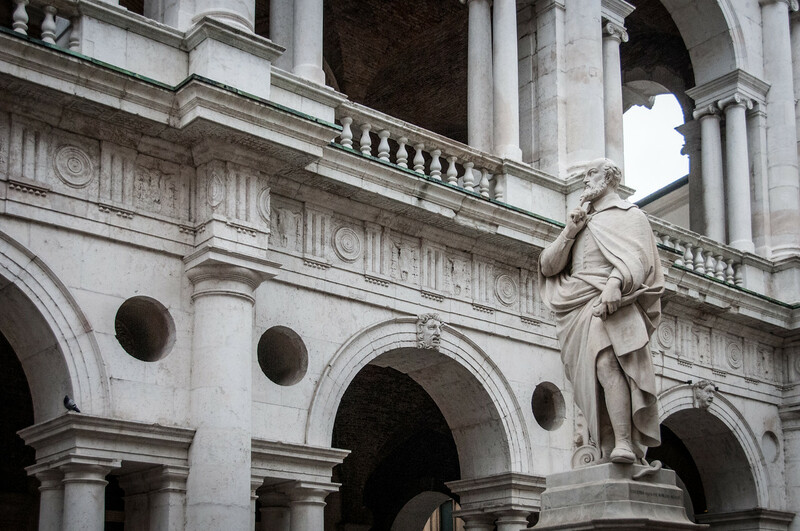 The wealth of its leading citizens resulted in the erection of many lavish buildings, strongly influenced by Venetian taste, but it was the advent of Andrea Palladio that gave Vicenza its enduring form. Andrea Palladio (1508-80) was profoundly influenced by his study of the surviving monuments of classical Rome and of the works of Vitruvius. For Vicenza he created both public (Basilica, Loggia del Capitaniato, Teatro Olimpico) and private buildings. A total of 26 individual buildings or parts of buildings known to have been designed or reconstructed by Palladio or attributed to him make up the World Heritage site – 23 in the city itself and three villas in its immediate environs. 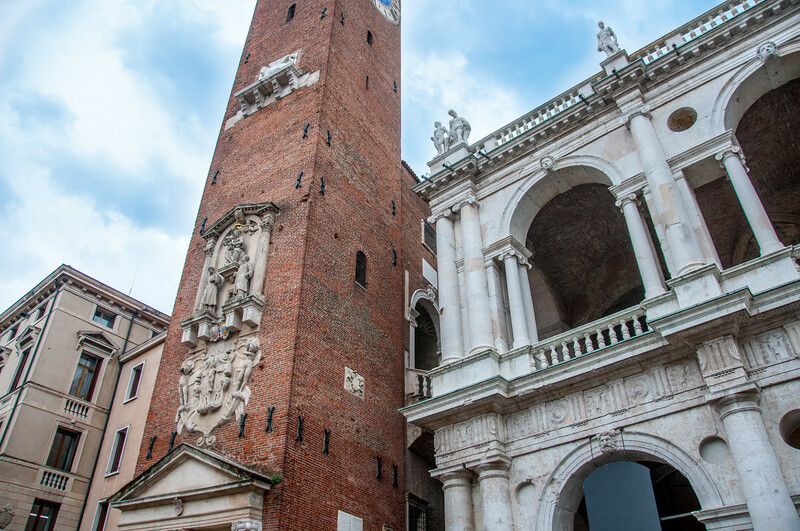 The palazzi or town houses were fitted into the urban texture of the medieval city, creating picturesque ensembles and continuous street facades in which the Veneto Gothic style combines with Palladio’s articulated classicism. 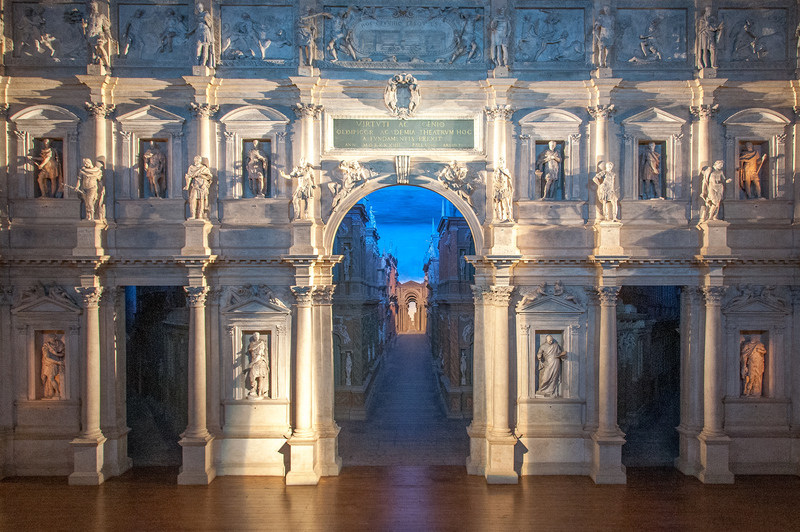 These urban compositions closely related to theatre design, which link reality and make-believe, are unique to Vicenza. A similar approach to composition is shown by the location of the suburban villa known as La Rotonda, as seen from the Villa Cricoli. It is easy to categorize Vincenza as another historical European city type of UNESCO site. 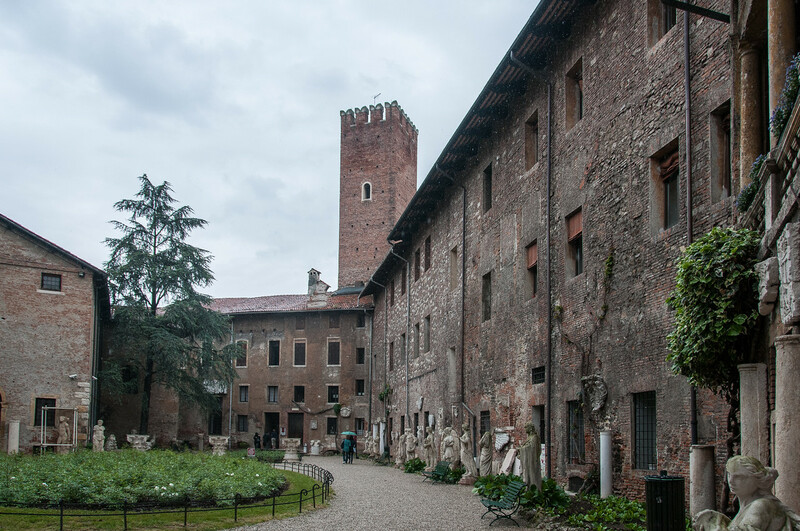 In fact, it is really an architectural site designed to showcase the work of Andrea Palladio. The site consists of two parts: the city of Vincenza and many villas located outside the city in the surrounding area. In the city, the primary Palladio buildings are the Basilica and the Teatro Olimpico (shown above). The basilica is actually not a church and contains the Torre Bissara, one of the highest towers in the city. The Teatro Olimpico is a greek style theater created for the city. The villas are harder to reach as they require a significant amount of walking or a car. 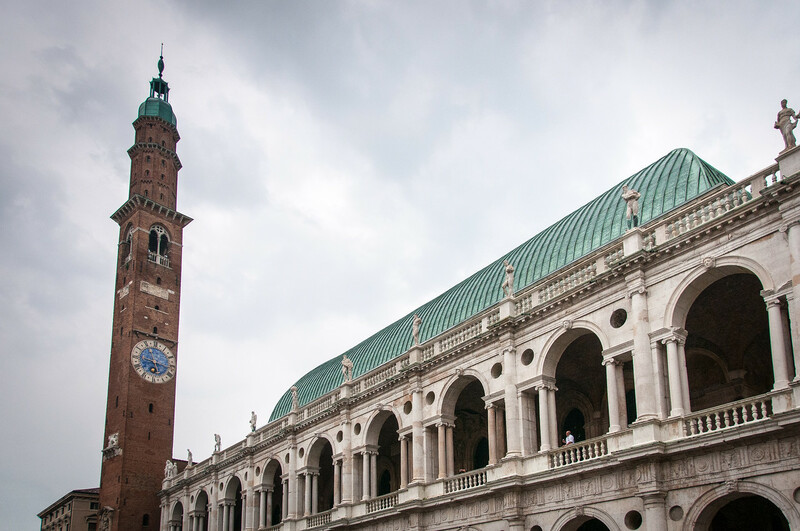 Vicenza is an easy day trip from either Verona or Venice, which it lies between. It can be reached by many of the high speed trains which leave from Venice as well as slower (and cheaper) regional trains. The City of Vicenza and the Palladian Villas of the Veneto is a cultural UNESCO World Heritage Site in Italy. It was inscribed in 1994 and is recognized for its representation of the Palladian style of architecture. This particular style became popular and influential in terms of the architectural designs used all over Europe and in the US. The UNESCO site consists of buildings and structures that were a creation of Architect Andrea Pallado, to which this particular architectural style was named after. The buildings that were included in this listing vary from basilicas, theatres, villas, and more. These buildings were mostly urban buildings. The city of Vicenza, which forms half of the UNESCO site City of Vicenza and the Palladian Villas of the Veneto, is a city known for its detail. Every street will offer something to admire. The extensive city planning and the unique architecture that defined this city combined to make it unique from all other Italian cities that are recognized by UNESCO as a World Heritage Site. Aside from the unique architectural landscape that the Palladian architectural style has brought to the city, it has also had a long-term influence on art history. It has harmoniously combined the architectonic works with urban spaces that later served as a model for modern and contemporary European architecture. The city of Vicenza was founded in the 6th and 7th centuries BC. In 1550, Palladio produced a wide range of villas wherein its scale and decoration completely matched the wealth and social standing of the owners. From the rich Pisani clan to the rich Venetian bankers and patricians, they wanted a villa that reflected their social and economic standing. This is how the City of Vicenza and the Palladian Villas of the Veneto came to be. Palladio designed their villas to have a loggia façade, huge vaults, stone piers, and rusticated Doric pilasters. The wealthy patrons of Palladio were impressed by his ability to create impressive designs without the need for stone carvings, which were much more expensive. The UNESCO site City of Vicenza and the Palladian Villas of the Veneto was extended in 1995. This extension included 21 rural villas within the Veneto region. All of these villas were also designed by Palladio. These villas serve as summer residences or villa-farms. This is truly a magnificent picture. It is the first time I heard of the Basilica and Theater. I think it would be fun to add to my travel list. Thanks for the info! Wow, what a great picture! I love those deep blues through the arch.